I'm enjoying some holiday time on our boat in the Southern Gulf Islands of British Columbia. We in our last week - but have been having a wonderful time relaxing and enjoying the sunshine. I even got a little stamping on a day that had a bit of rain. 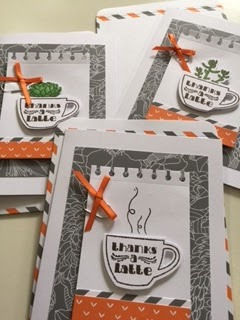 Check out my finished cards from the July Paper Pumpkin kit. This month's cards are so cute! If you haven't checked out Paper Pumpkin yet, there is a great offer for new subscribers (or previous subscribers with a new email address) - 50% off your kit for the first 2 months. Paper Pumpkin is a great "all inclusive" kit that comes to your door each month automatically. It contains everything you need to make a set of cards or a project. The cost is $24.95 per month (includes shipping). If you take advantage of the offer before September 10th, you'll pay half price for the first two months. You can choose to stop at any time after your first two kits or you can choose to take a break. I'm not sure why you'd do either of these, but the options are there! If you have questions, email me or click here to start your subscription. Have a look at the Weekly Specials for this week. Have any questions or want to put your name down to receive a Holiday Catalogue - email me!